A NEW laboratory-free test can detect dangerous levels of histamine in foodstuffs including seafood, fish meal, wine, and milk in just four minutes. 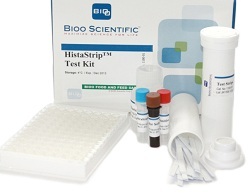 The HistaStrip test kit from Bioo Scientific uses a dipstick approach, providing a visual indication of histamine levels without any additional equipment, solvents, or processes. HistaStrips contain a pad impregnated with reagents which undergo a chemical reaction in contact with histamine. When dipped into a sample, the pad will rapidly change colour if histamine is present. Bioo says that the detection capabilities of Histastrips are ‘well below’ global action levels, and the portable convenience of the test allows rapid testing in the field or in the lab. “HistaStrip is designed to work in any environment and can be conveniently performed at any point in the supply chain from the marine dockside to the kitchen counter”, said Dr Joe Krebs, director of protein chemistry and engineering at Bioo Scientific. Histamine can contaminate seafood that is handled improperly. Good quality tuna may have a histamine level below 50ppm. Traditional testing for the histamine contamination would involve laboratory tests such as liquid chromatography/mass spectrometry (LC/MS) or enzyme-linked immunosorbent assay (Elisa), which are relatively expensive and time-consuming.